See her shimmering bass strings move! Servants all to finger and thumb. For bleating sheep's gut forms each string. Then quick! Make haste, undo the lock! A palace fit for royalty. What better than the Triple's Charm? From sullen depths to joyous height. And on the hearth so old and warm .....' The music and playing of Nansi Richards has always been an influence on me as a Welsh Triple Harpist, and I am always aware of the depth of the unbroken harp tradition in Wales that Nansi and I are both a part of. But this time, in putting this album together, I have been inspired not just by Nansi's music but also by her words as a poet. Her poem quoted here has been at the root of this collection. Nansi's playing is of course reflected here in both Morfa'r Frenhines and Y Dydd, which, fully in keeping with tradition, I have set with new variations. But the historical aspect is reflected too, in Blind Parry's exquisite Baroque variations of Dafydd y Garreg Wen (with its traditional coda Ysgubor y Barwn), and also in several melodies from the publications of Edward Jones (Ffarwel fy Ieuenctid - set again with my own variations), Ieuan Ddu (Clychau Caerfyrddin - The Bells of Carmarthen), and Nicholas bennett (Clychau Llanfyllin - The Bells of Llanfyllin), together forming Clychau'r Hen Wlad. For variety's sake I have included several modern compositions, such as Delyth Evan's dramatically lyrical Mwynder Maldwyn and the profound harmonic and rhythmic complexities of Anne Morgan Jones's contemporary masterpiece Llinyn Arian. 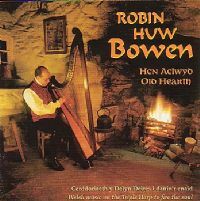 I myself have composed Hen Aelwyd and its partner Llif Ystwyth in order to have a title track to set the mood, and I have always thought Tudur Huws-Jones's traditional-style melody Hwylio Adref far too lovely for the tin-whistle! And how could such a collection be complete without some of those typically Welsh 'unrequited' love-songs (Hiraeth and Y Gwydr Glas)? So, there we are. All you need do now is close the door, take the phone off the hook, stoke up the fire, put your feet up, and let the beautiful melodies of Wales and the clear shimmering voice of the uniquely Welsh Triple Harp weave their magic on your soul. Sit back and think of Wales ....! Robin Huw Bowen, Aberystwyth 1999.